Agriculture Products Extension (APEX), Batavia (at the former LV depot site) - NEW! The DLWR operates three lines, two in Batavia and one in Erie County between Lancaster and Depew (the Batavia and Lancaster divisions, respectively). In Erie County, the DLWR operates the former Conrail Lancaster Industrial Track, now owned by the Erie County Industrial Development Agency, between Lancaster and the former Bison Yard in Depew, east of Buffalo, from MP 385.4 to MP 382.75. Currently, only two online customers are being serviced. Power is an Alco RS-11 #1800 which is stored at a new enginehouse in Lancaster. The crews from the Falls Road switch this line on Tuesday and Thursday mornings. In Spring 1999, an upgrade project was completed. This line received 4000 new ties and switch timbers, and surfacing, making it a 40 MPH railroad. 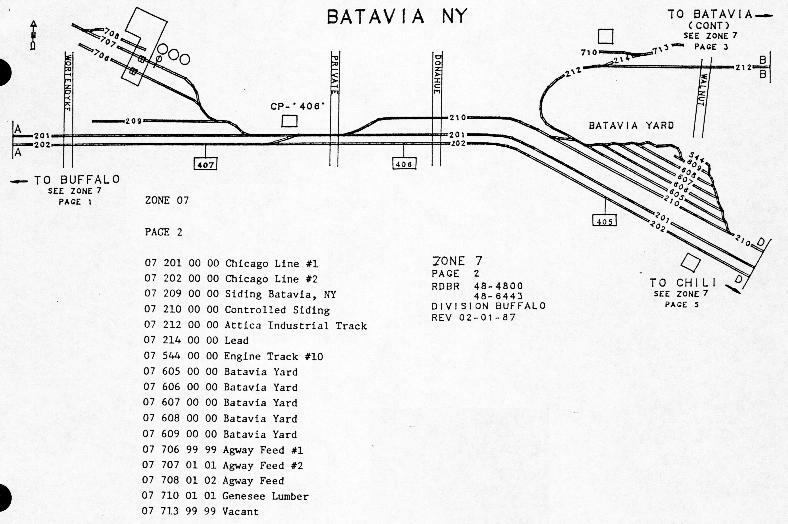 Conrail ZTS Maps and of the local Batavia tracks (now DLWR)!!! 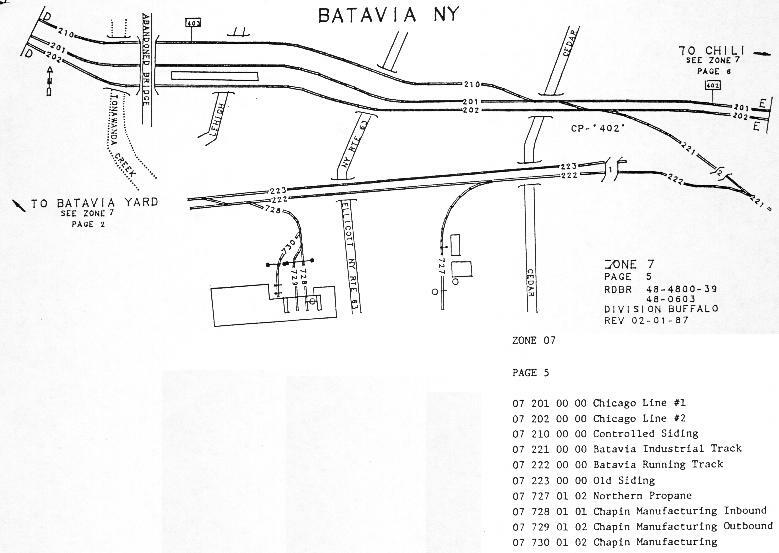 Here are some Conrail ZTS maps from 1987 showing the DLWR's trackage in Batavia. With the exception of the Conrail mainline and controlled siding, everything else has been since transferred ot the DLWR. What these maps do not show is the siding into Majic Corrugated, where the DLWR stores their engine. Also missing from the map is a siding for a beer distribution center across the street from Majic. 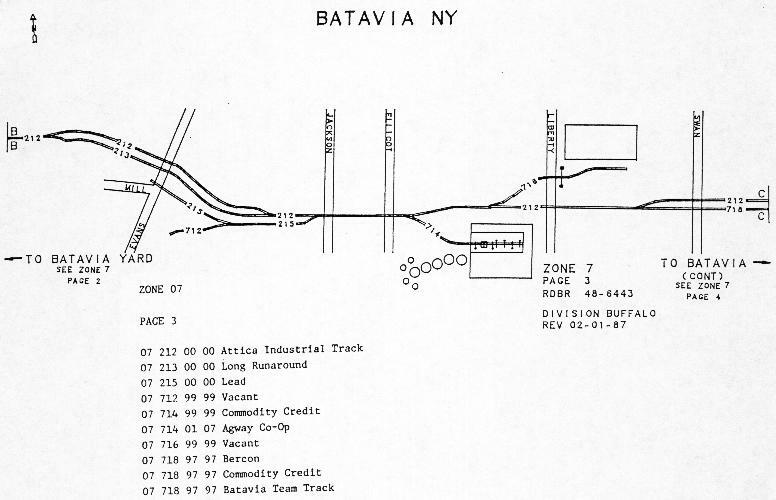 Both of these facilities were built after the maps were drawn, and are located just northwest of Batavia Yard on the Attica Industrial Track. Click here to view a track diagram of the DLWR's Lancaster Division from Bob Racer's web site. NEW: Here's another map of the DLWR in Batavia. It's a large image (600k), and shows the line in relation to current day CSX as well as abandoned lines from yesteryear. In Batavia, the DLWR occupies the Former Conrail Attica Industrial Track running through the center of Batvia, the Batavia Yard, which is located off the Conrail Mainline controlled siding at MP 402, and the Batavia Industrial and Running Tracks (former Lehigh Valley line), located at CP 402 on the mainline. According to the ZTS maps (linked above), the DLWR in Batavia only needs to cross the Mainline at CP 402, and occupies the controlled siding to move its trains. Work in Batavia usually starts around 11:00 am to noon by the Falls Road crew on thier off days (Tuesday and Thursday) following interchange with a CSX local out of Rochester. Radio frequency used is 160.920 MHz, and 160.800 to obtain permission from the CSX dispatcher to enter Batavia Yard, the controlled siding, and to cross over CP-402. 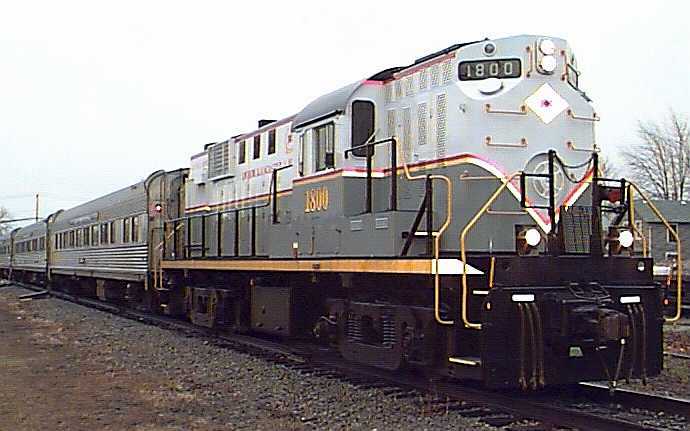 Locomotive power in Batavia is an MLW RS-18 #1801 still in the R&S's yellow/grey scheme. 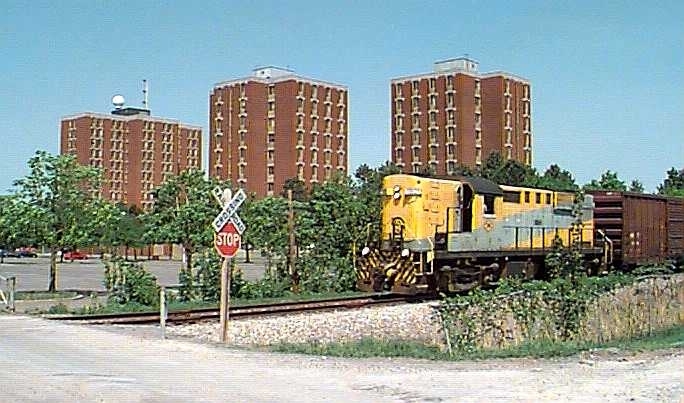 The DLRW uses an ex-CN caboose (also in GVT colors) for shoving through town and on the CSX controlled siding between CP-406, Batavia Yard and CP-402. Spring 1999 will bring some upgrade projects to the Batavia Division with switch upgrades and tie work, along with three crossing replacements. The switch and lead to the Agway Fertilizer plant is scheduled to be rebuilt. HISTORY: The Lancaster division is part of the former Delaware Lackawanna & Western mainline, which was not included when Conrail was formed in 1976. 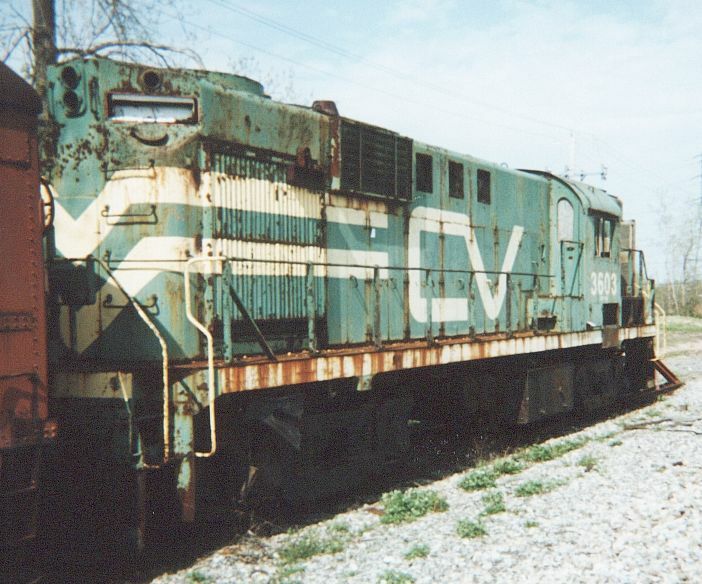 It was purchased by the Erie County Industrial Development Agency and run by Conrail under contract until April 1988, whcn service ended. On August 1, 1989, the Depew Lancaster & Western was designated to operate the line. The Batavia divsion is former Lehigh Valley and New York Central trackage purchased from Conrail in August 1983.